Though diminished amid the noise of the Internet age and the general watering-down of all things celebrity, star power can still be a curious thing, particularly in a film like No Strings Attached, an otherwise tedious and forgettable RomCom of the January variety that just barely manages to exceed all conceivable expectations thanks to a surprisingly nuanced performance from Oscar contender Natalie Portman. While it's wholly unlikely that the film's unexpected merits will overcome its myriad deficits sufficiently for it to have a good fate at the box office, it should give both filmmakers and distributors pause to reconsider the actual value of talent when assembling their hodge-podge, marketing-driven casts. 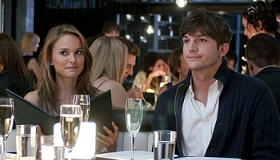 The routine romantic comedy centers on Emma (Portman) and Adam (Ashton Kutcher) whose first awkward meeting at a camp as teenagers is followed in subsequent years by happenstance When Harry Met Sally-like meetings, each of which stir a certain something. When they meet yet once more, he's a lowly assistant at a Glee-style television show, living in the shadow of his sitcom star father (Kevin Kline), and she's a resident at a learning hospital. Both have relationship issues, thanks to less-than-responsible role model parents. Adam's dope-smoking, twice-married dad just hooked up with his ex-girlfriend while Emma's equally unreliable mom is about to shack up with a drifter known only as "Bones." Splitting the difference between attraction and fear of commitment, Adam and Emma agree to a casual arrangement wherein each will simply make themselves available to the other for sexual gratification anytime, anywhere. As even average students of the romantic comedy surely know, such liaisons will ultimately do nothing but encourage a deeper yearning in both for true love and all the requisite trimmings. (Boy meets girl, boy loses girl, boy gets girl back.) Kutcher is obviously no stranger to films of this type, he's practically built a career on them, but it's a curious turn for Portman whose intense and impassioned Black Swan performance has put her on the verge of winning an Academy Award. That's not to say that serious actresses ought not have a right to flex other muscles, Portman wouldn't be the first to do so, but by the same token, had the same film been made with Katherine Heigl or Kristen Bell in the part there's little doubt the result would have been exponentially less tolerable. Only slightly less puzzling than Portman's involvement with the film is that of director Ivan Reitman, the former '80s era A-lister who now dwells in the shadow of his markedly more talented son, Up in the Air and Juno director Jason. Once a prolific purveyor of high-concept comedies like Ghostbusters and Twins, Reitman's output as a director over the past decade has slowed to a crawl, with just two subpar, underperforming pictures to his credit: 2001's Evolution and 2006's misbegotten My Super Ex-Girlfriend. Even when measured against substandard Reitman, however, No Strings Attached feels strangely generic—the kind of thing Garry Marshall might have tossed off twenty years ago just to keep himself busy between bigger projects. It's not incompetently made, but neither is it distinguished, either technically or otherwise, as has been the case even with Reitman's past misfires. Nonetheless, Reitman and Portman still carry enough legitimacy to help pack the supporting cast with strong performers, from the miscast but still engaging Kline and an unrecognizable and underused Cary Elwes, to firmer work by Lake Bell, Greta Gerwig, Jake Johnson, Olivia Thirlby, Mindy Kaling and Ludacris. In the end, it's more window dressing than substance, but with material this thin and derivative, every little bit helps. The curse of January releases notwithstanding, No Strings Attached will find itself hamstrung by a less obvious miscalculation: needlessly indulging the story's raunchier elements in pursuit of an "R" rating, rather than the softer PG-13 with which comparably unremarkable romantic comedies have still managed respectable numbers. Unless the Hangover and Wedding Crashers set has suddenly developed a taste for romances that aim to elicit more tears than belly laughs, even Portman's deft efforts will prove insufficient to get much love from filmgoers. Rating: R for sexual content, language and some drug material.